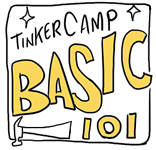 Registration for Summer Tinker Camp 2019, Spots are filling up! Register online following links below, Contact darcy@tinkertopia.com with any questions! Join Tinkertopia's Creative Reuse Team during a week long adventure of building super contraptions, fantastical sculptures, and mystery bag design challenges. Kids use a variety of upcycled materials and learn basic engineering techniques as they explore creative process and the world of found art assemblage. Geared toward youngsters enrolled in Kindergarten to Second Grade and is a great way to jump into our Low-Tech Tinkerspace with daily STEAM project fun. Science Technology Engineering Art and Math! For Tinker Cadets who have attended our previous camps, we will be concentrating on exploration of specific material properties and child-directed projects. Visions will be realized, this camp is for artists and crafts persons of destiny. A deep dive into the very soul of human creativity! Are you ready? Tag us in your Tinker Creation Picture #tinkertopia; #tinkerbuilt SEE ALSO: Tinkerspace Photostream! About Us - Tacoma Creative Reuse Summer Tinker Camp! Tinkertopia, LLC. works with local businesses, capturing safe, reusable materials from the wastestream (aka Great Material Continuum), and reimagines these as unusual arts and craft supplies for kids, teachers, makers and tinkerers. Monday - Saturday 10 am - 6 pm. "TinkerTopia" is a Registered Trademark of Tinkertopia, LLC. © 2012-2019 A.D. All rights reserved. Tinkertopia, LLC.